This is absolutely my favorite way to eat lamb. It’s fatty and juicy and tender and yummy, and this recipe is SIMPLE. Don’t trim away any fat, and whatever has melted into the juices make sure you spoon back on top to get the full flavor. 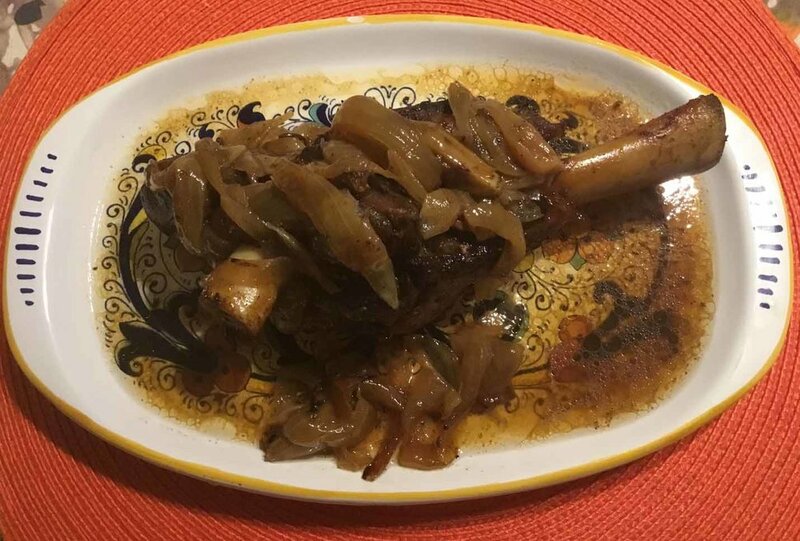 There are many simple ways to make lamb shanks and this is just one way that we enjoy! And, let me add, if there ever were a case for not counting macros, but just enjoying a Keto meal in moderation, this would be it. You’ll see why when you look at the recipe macro summary. I suggest to my clients that, even if they are obsessed with counting macros, at the end of a “good” week, to just enjoy a meal like this and don’t worry! You can adjust what you eat during the day if you are concerned about the macros. Rub in olive oil, salt and pepper. Sear meat 6–7 minutes on high heat, in a cast iron pan if you have one. Transfer lamb shanks to a baking tray. Using the same pan, sauté onion rings about 5 minutes until softened. If there isn’t enough fat from the lamb left behind in the pan, add a few drops of olive or avocado oil. Cover lamb with cooked onion rings. Put the separated cloves of garlic all around the shanks. If using wine, pour in now. The nutritional information given below is a little different for this recipe because lamb shanks can vary wildly in size. Also, because I am not weighing out the onions and the red wine is optional, the sauce could vary. Figure your wine if you are using any and I personally would add 10 grams of fat for a quarter of whatever the sauce comes out to be.